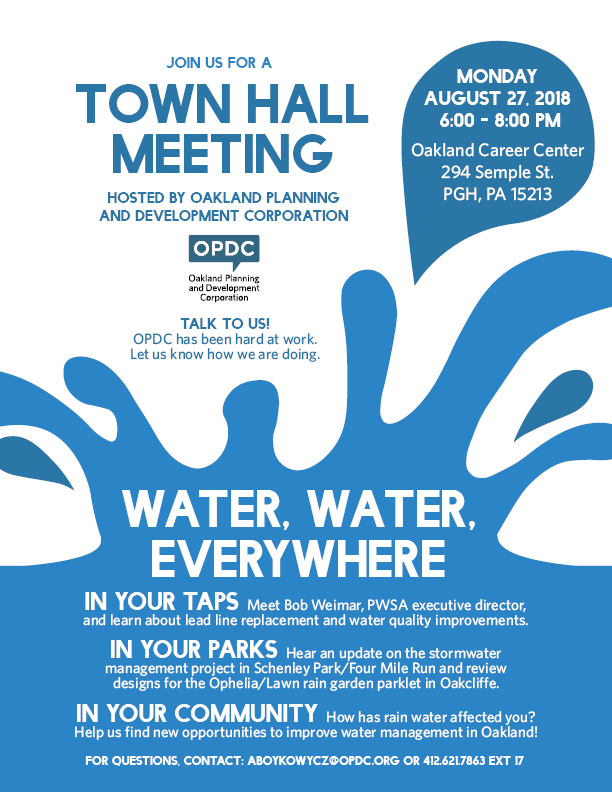 Join OPDC for a town hall meeting on Monday, August 27, 2018 from 6:00 - 8:00 PM in the Oakland Career Center (294 Semple Street, Pgh, PA, 15213) to hear about water management projects in Oakland. Meet Bob Weimar, PWSA executive director, and learn about lead line replacement and water quality improvements. Hear an update on the stormwater management project in Schenley Park/Four Mile Run. Review designs for the Ophelia/Lawn rain garden parklet in Oakcliffe. Share with us other opportunities to improve water management in the neighborhood. For questions, please contact: aboykowycz@opdc.org or 412.621.7863 ext 17.